Recent new elements concerning the attack with the nerve agent sarin on the 21st of August in Syria point to the fact that, in contrast to earlier claims put forward by among others Human Rights Watch and the New York Times, there is not one shred of proof the Syrian army was involved. On the 28th of December 2013 the New York Times to a certain degree withdrew its previous claims although it blamed the US government and not itself for the lies produced then back in September 2013. However Human Rights Watch still didn’t react to these developments and so continues to stick to its old now discredited lies. By linking the August 21st sarin attack in Ghouta to the elite military unit of the Syrian army this could have led to a serious destabilization of this main fighting unit defending Damascus against Al Qaeda linked groups. Was this the real intent of Human Rights Watch, thereby making it also sure the US would attack Syria resulting in a jihadist Al Qaeda victory? Human Rights Watch and the NYT then based it very grave accusations against the Syrian government and especially the 104th Brigade of the Syrian Republican Guard on two main elements. First there were the azimuths of these rockets found and then there was the distance these rockets supposedly could fly. By linking the attack to the elite military unit of the Syrian army this could have led to a serious destabilization of this main fighting unit defending Damascus against Al Qaeda linked groups. Was this the real intent of HRW, thereby making it also sure the US would attack Syria resulting in a jihadist Al Qaeda victory? However these azimuths first are totally unreliable as they were deducted from rockets found in rebel controlled areas days after the attacks and shown to the UN-mission by these rebels. Rebels which included elements of Jabhat Al Nusra, officially designated by the US government as a terrorist organization linked to Al Qaeda. Making any dealings of US citizens with it a crime. This is the same group that on the 11th of September 2001 attacked the World Trade Center in New York killing more than 3000 people. Therefore evidence as the azimuths of these rockets is totally unreliable from a forensic point of view. No serious investigator would base anything on it. But no problem for HRW who without hesitation used this to make such very strong accusations. Another lie by HRW was the distance this 330mm rocket found in al Tarma/Zamalka near Damascus could fly. They concluded it could fly at least more than 9 km. 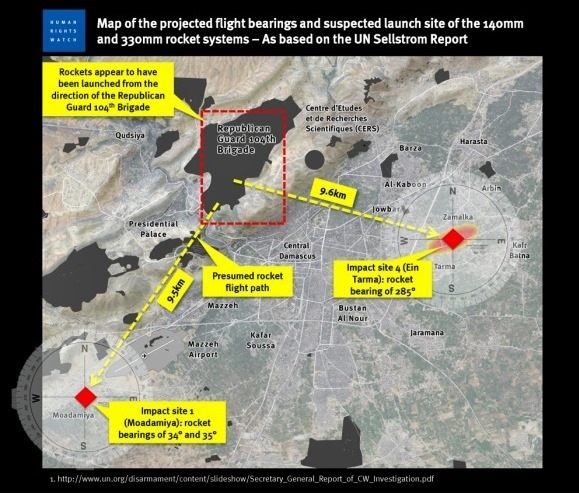 Evidence from different sources, including one coming from Ake Sellstrom, head of this UN-mission on Syria, shows that this rocket could fly at best 3,5 km and almost certainly less. Thereby making the claim regarding the Syrian army doubtful. And that against the Republican Guard base a lie. The two questions posed on the 2nd of January by telephone and mail to the press office at the New York headquarters of HRW were therefore simple and straightforward. What’s the reaction of HRW regarding the new elements coming to light concerning these rockets? And so will HRW apologize to those people it wrongly accused of being responsible for the death of hundreds of children as claimed by HRW? As a professional organization stating to defend human rights it is essential its statements regarding human rights abuses are based on solid grounds. Here they obviously were not. Still HRW refuses to answer these two simple questions. Raising more suspicions about the true nature of this organization. Here in Syria, as in Libya before, it works closely with jihadist organizations whose aims are contrary to what human rights are supposed to be. Recently it was also disclosed they worked hand in hand with a Swiss Ngo called Al Karama. Here to this was found out by the US government to be financing Al Qaeda and spreading its ideology. Any serious research of Al Karama would have found already years ago the links between extremist Salafist groups and this NGO. Human Rights Watch didn’t. It were their ‘friends’. This also has to be viewed in the light of the visit of Sarah Leah Whitson, director for North Africa and the Middle East at HRW, in May 2009 to collect funds in Saudi Arabia, main ideological and financial backer of jihadist groups worldwide including Al Qaeda. After al Salafisme is the official state religion of the country, one of the most brutal dictatorial governments on earth. It is as if someone went to Adolf Hitler to ask for money to build synagogues. Another striking thing revealed by the Syrian file of Human Rights Watch is the dubious nature of their ‘research’. When confronted with this attack on the 21st of August and the videos uploaded on the internet by the Sham News Network they, as HRW themselves wrote, talked to those who had uploaded these video’s to verify the facts. And this was sufficient for them. A work method totally opposed to what any serious research should be. It is as asking someone who wants to sell you a carpet if he’s sure it can fly. And then of course you get a yes. You can hardly expect anything else. But as the name suggest, Sham News Network – Sham is the Salafist name for Syria – is a jihadist organization wanting to introduce sharia law and a Salafist caliphate in the country and elsewhere. It works among others closely and at least partly under control of Jabhat Al Nustra, the US labelled terror organization linked to Al Qaeda. So Al Qaeda sets video’s online and HRW asks an Al Qaeda linked group if they are correct? With that in mind who on earth should take anything coming from Human Rights Watch as being the truth? It is therefore no surprise at all Human Rights Watch didn’t oppose the plans at that time for an American bombardment of Syria. Luckily US Congress and the White House later had other and better ideas. So whose human rights does HRW really defend? And will HRW come clean regarding Syria and the whole Middle East?